What is emergency evacuation, and is it all that important? Emergency evacuation is often the most expensive part of the bill if you are hurt overseas and is often considered the most important part of any emergency travel health insurance. As a layperson, I’ve been learning that it is much more than a simple helicopter coming to get you and taking you to the nearest medical facility – Emergency evacuation also entails contacting foreign embassies for permission to come get you, to depart the country, working with border patrol/customs, quickly finding a plane, crew, and medical professionals that can evacuate you from wherever you are, filing flight plans for the fastest route and getting permission from air control, letting the receiving hospital and a ground ambulance know you are on the way,…it’s a complicated process! On top of all those costs and details, the hospital bill by itself could be huge, and your typical U.S. health insurance won’t cover you all the way over there. For sure, they won’t pay if a commercial airline has to pull out and remove three rows of seats to fit your stretcher! (Hint: It will cost quite a bit more than the cost of the 6 seats at the last minute!) The easy alternative is a travel insurance policy with $250,000 to $500,000 in emergency evacuation coverage for under $2.00 per day on average. Why do I need emergency evacuation? So many people travel overseas without good insurance, but what would happen if some unexpected accident were to happen? The last thing you want is to be operated on in some small village, suddenly, and then with no way out of the country (since you missed your flight). Or being by yourself and not even understanding the language well. (Most travel policies include translation assistance over the phone and include emergency reunion – which means a loved one can fly to be with you if you are going to be in the hospital for a while. Even paying for the missed flight and the flight or missed flight of someone who is going to stay with you to help.) Having good insurance with emergency evacuation ensures that you or your family won’t be burdened with the unexpected expenses of rushing you back home or being treated at a hospital overseas. If I were to be hurt overseas without emergency evacuation, my parents would probably have to sell the house to get me back home safely. A senior citizen could have to wipe out their retirement to pay the emergency helicopter ride and overseas hospital bill. Or in one case I was told about, the three children each had to borrow money to get their dad home after a nasty fall while helping build homes in South America. Most people that contact Good Neighbor Insurance are traveling to places that are remote, poorer, or don’t have the best medical care locally. If you get hurt (or sick) but have emergency evacuation coverage, you’ll be flown to another country to get the care you need. Or in the case of a MedJet plan by Good Neighbor, flown home to the hospital of your choice. Why would someone get an “evacuation only” plan? 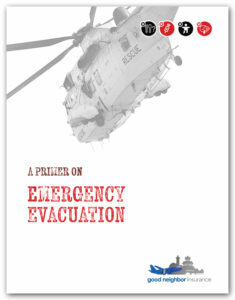 Some of GNI’s “evacuation only” plans are offered by Medjet. People like Medjet because it won’t force them to go to the nearest hospital (which is usually located in another close-by foreign country). It will fly you back to the U.S. (or Canada) to the hospital of your choice. These plans are good if someone is on Medicare or on a “medical share plan” back in the USA. Included in Medjet are some other benefits, such as return of mortal remains (find out what that is and why it’s important here: https://www.gninsurance.com/blog/news-and-helpful-links/repatriation-of-remains-explained/) and telephone interpretation. Interpretation is extremely helpful when you’re in another country and the doctors are trying to explain to you what’s wrong, or what they want to do to you. See more about why we like Medjet here: https://www.gninsurance.com/international-insurance-plans-listed-company-name/like-medjet-assist-emergency-evacuation/. Again, “Emergency evacuation only” may be a good fit for seniors who are on medicare, minors who are on their parents’ insurance plan, and people on a “medical share plan.” They have medical insurance in the US, and so flying back to the US makes sense, because their medical expenses will be covered there. Regular short-term plans also include evacuation and are often cheaper! All of the plans GNI offers include emergency evacuation. Both long-term plans for living overseas more than a year and short-term travel plans for trips of 2 days to 12 months. Sometimes a regular short-term travel insurance plan (with $250,000 included emergency evacuation) will actually be cheaper than emergency evacuation by itself. The short-term plan won’t bring you all the way back to the U.S. if there’s a closer hospital for you to go to, but you’ll be covered by that short-term travel plans international medical coverage anyway. When in doubt, call Good Neighbor! They’ll be happy to help you find the best plan to fit you. Is it worth it? Pay $40 up front for emergency evacuation or risk paying $40,000 in emergency plane ticket and hospital expenses when they all start billing you later on. Be sure that you and your teams always have emergency evacuation when you travel, it is the smart thing to do. As always, please give GNI experts a call if you have any questions!